When we first "grasped" the hilt of the Magic Sword, we were unable to pull it from it's Venetian scabbard. The symbolism of the hilt itself allowed us to discover Arabian and Greek origins that confirm Chrétien's symbolism. We have, however, a bit of a problem at this point: We identified Guifré el Pilos, the historical model of Perceval, and a quest for the Holy Grail (blood-relic) that is "guarded" by a Fisherking (Peter's relics). We followed Chrétien, had some support from Wolfram, and confirmed part of Robert de Boron's history. But what about Chrétien's GRAAL, which is clearly not a blood-relic, but a large bowl or platter, a simple household item? Before introducing Arthurian romance to the world, the French poet wrote some adaptations of Ovid's metamorphoses, which are unfortunately lost. But in view of the Iconoclasm during the late 8th century, we could conclude that the blood-relic "morphed" into a simple bowl or platter! As if perhaps, the former is dismissed as Robert's historical content, dark matter in a sense, and the latter became the symbol of enlightenment, the higher, spiritual path of the "seekers", once they had abandoned the search for the relics. Also this hypothesis is supported by the only qualified "second opinion" that exists, the works of the German poet Wolfram: He "morphed" the grail even farther, to a lapsit exillis, a stone from paradise with such magical powers that it revives the phoenix after it burns to ashes. In Parzival (P.453) he tells us that Kyot discovered the origins of the mystery in Spain, in a discarded manuscript of Flegetanis, information about the grail that is revealed by the stars, "something hidden and mysterious he was very shy to talk about". So that he could understand it without using necromancy (see Ovid! ), Kyot had to learn the abc's of the Heathen language and "it helped him that he was baptized or this would have remained unknown to this day." "The wise master Kyot began to research these things in Latin books to find a people worthy of the grail. He read the chronicles of Britain and elsewhere, in France and Ireland. He found them at last in "Anschaue". At this point we have Wolfram's full support that we are on the right track. We found the grail family and other keys to the mystery in actual Latin chronicles, one from Cuixà, and the other from San Pere de Rodes. And indeed, not in Britain, France and Ireland, but in Catalonia. Scholars tend to translate "Anschaue" as Anjou in France, which has never led anywhere, but we rely on Wolfram's brilliant mind: Because Chrétien's etymology of GRAAL took us to Catalonia, Wolfram's "Anschaue" should take us there as well. In German, "Anschaue" is a clear command to open our eyes like wir sollen das anschauen, we should look at it! But at what? What did Wolfram and Kyot see in Catalonia that we are supposed to look at? And here it is: Just look at the picture below! But what is the meaning of the fiery "grala" Mary is showing us? Which Mary is it? 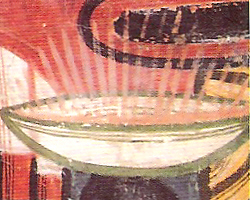 Is this an image of the actual fusion from the "cup of the Last Supper" to a simple "grail", as Roy Lichtenstein would have captured it? And a Cubist painter? And is her right hand raised in a defensive gesture, and her face reacting to a bad smell, like sulfur? Or is this about alchemy, and she is holding up something explosive and very powerful, and her lips are sealed so she doesn't reveal the secret? Yes, a lot of meaning can be read into her face and body language – and into the fiery bowl! Several of these vessels from the early 12th century were found in churches near Urgell, a town in the Pyrenees which figures so prominently in our researches. It was the center of Adoptionism during the late 8th century, propagated by bishop Felix of Urgell, until censured by the Carolingians, and reduced to the filioque compromise of Charlemagne. We identified Guifré el Pilos as Perceval, whose father was Sunifred of Urgell and Carcassonne, count of Barcelona. Chrétien's graal leads to Urgell as well: "...una escritura catalana, y por mas senas urgelense, escrita en latin en el ano 1010: 'as sancta Fide coenobio gradales duas de argento'." Although we established the etymology of graal through the Oxford Dictionary, du Cange, and Coromines, we owe this major discovery in all probability to Pujades as well. Du Cange lists the "Marca Hispanica", p. 973, as his source, which seems strange. The Glossarium was published in 1678, ten years before his death in 1688, and the same year Baluze published the "Marca Hispanica". But du Cange could have seen these sources earlier, during the meetings of Parisian savants at the Benedictine abbey Saint-Germain-des-Prés. We have shown that Baluze used this illustrious circle to promote his academic position and career by sharing the rare documents he inherited from Pierre de Marca – most of which had been taken from Pujades, allegedly by "force of arms". According to J. Goering (1), the grail paintings of the Urgell region "were first brought to the attention of the modern world when they were copied in 1908 by Joan Vallhonrat i Sadurni, a friend of Picasso", incl. the above Mary from Sant Climent de Taüll. The exhibit of the copies caused quite a sensation (2), followed by a publication of various other "grails" from churches in the region (3), after which the originals were carefully removed and taken to the Museu Nacional d'Art de Catalunya in Barcelona. Amazing as it seems, but the connection to the grail was not recognized by the Catalan experts! 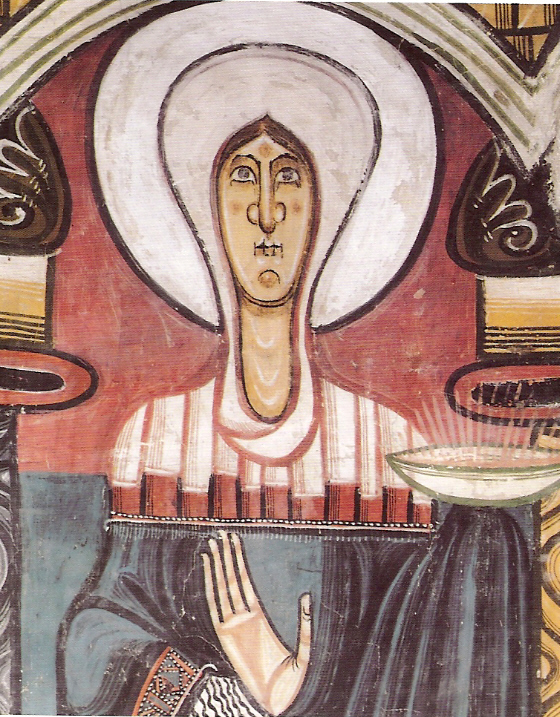 Another surprise is the fact that the above "fiery grala" was painted circa 1123, before Chrétien was born! which reveals that the French poet had taken the "valley of valleys" (Val d'Aran) to check out the paintings himself, and that Robert and Wolfram had made the same trip later! This important news because Chrétien's GRAAL is visually confirmed and Kyot's search as well. It makes Urgell the prime location where we should find the third Latin chronicle to take us up to the next level. Or have we found it already? The first written mention of the grail is from 1010 CE, a Latin text from Urgell, and now that we have visual proof to confirm "Anschaue", we must check if Urgell is the place where all grail symbolism fuses together. If we mark Cuixà and Taüll on Google Earth, we have a beautiful triangle with Montserrat as they are 80 miles from each other. Bu we can also see that Sant Pere de Rodes is outside the triangle, which may reduce it to an entry level to seek the higher mystery with the triangle. Could this be a signal to go from the microcosm to the macrocosm, to find the triangles in the sky? Looks like a Key OT, because Michael Scot has written an interesting variation of the "Star of Bethlehem", which he developed from Plutarch! Let's first review the facts before we make a decision: The etymology of Chrétien's GRAAL led to Urgell and to the family of Guifré el Pilos. We found a Latin chronicle about his vita, which is similar to Perceval's, but important parts are easily exposed as inventions. This is why Chrétien had to "take great pains" to correct them with a "mellor conte". . Wolfram's second opinion confirms the search for Latin chronicles, and reveals that we must begin in "Anschaue". We opened our eyes and found several "gralas" in the region of Urgell. But what does this grala on the left radiate? Why did Wolfram make certain changes of Chrétien's version? And why did he shorten his GRAAL to gral? It looks like we are invited by this vessel to attempt our first alchemist fusion! But what does this really mean? Most people think that this was one of those medieval superstitions, directly related to black magic, because we know that alchemy was used for attempts to "transmute" metals to gold. In reality, it was more like a philosophical approach to solve difficult science problems. Most so-called "alchemists" were originally medieval scholars who had the imagination to investigate new ideas, including many Roman Catholics. The first alchemist to be elected bishop of Rome was Gerbert of Aurillac, who became pope Sylvester II in 999. He started his career as protégé of Borrel, count of Barcelona, a direct descendant of Guifré/Perceval. The most famous Catholic alchemists were Albertus Magnus and his pupil Thomas Aquinas, who used it to define "transubstantiation". For anyone outside of the Christian faith it is difficult to understand that during the most holy Eucharist ceremony, the "host" (a wafer of bread) transforms physically into the body (flesh) of Christ, and the wine into his blood. Please note that this is not meant symbolically, but 100% literally! This is but one example to help us better understand the potential of alchemy. We don't know what kind of alchemy is radiating from the above fiery bowl, but the "creta" of Pliny and the "cratus" of Plato, the divine mixing bowl of life, come to mind. Is it very difficult to discern, but it seems that this magic is forcing us to try our first fusion of GRAAL. We are limited at this level of our quest to a simple exercise for beginners – but with some results, as you will see! The Oxford informs us that the Old French "graal" was known in Provence as "grasal" and "grazal", and in Old Catalan as "gresal". According to the Catalan scholar Coromines, it is "gradal" in archaic Catalan, and became "grasala" in the regions of the Rosselo (North of Pyrenees), Alt Empordà and Vic of Ausona (South of Pyrenees). In Pallars it was known as "griala", as "greala" in Sagarra (both near Urgell), and as "grala" in Montserrat. If we fuse these different forms, we find a definite "essence" or focus of them all in grala. It is the simplest form and confirms Chrétien's GRAAL where the "a" is moved, and Wolfram's "gral", where it is simply removed. A logical step, because he worked later. Some of you may disagree with our "literary alchemy", but the solution speaks for itself: Just as graal had led to Urgell, the word grala takes us to Montserrat! Some of you will be a bit disappointed, because Montserrat is nothing new, it has often been mentioned in the context of the grail mystery, especially by scholars who noticed Wolfram's clues that point to Spain and Catalonia. But all attempts to solve the mystery of Montserrat have failed – and had to fail – because there are too many pieces of missing information. Only after the two Latin chronicles, the one from Cuixà and the other from San Pere de Rodes are identified and understood is the chronicle of Montserrat accessible. We needed the missing facts and we had to go through the experience that documents on parchment, written by pious monks, do not necessarily tell the truth if it serves a "higher purpose". And we needed the support of modern historians, who missed the big picture, but would generously preserve these lies as legends. But above all, we can only achieve this quest because we have a trusted friend as guide, the enlightened historian Jeroni Pujades, who saved for us every piece of evidence four hundred years ago. Only with his help is it possible to decode the third and last Latin chronicle and question the holiness of the holiest place in Catalonia! Yes, Montserrat is about the greatest cover-up of them all, and after this exciting "adventure" high in the sky, we'll be able to fuse all three chronicles far below "where the source lies in darkness" to reveal the whole truth and nothing but the truth. By exposing the Venetian cover-up, symbolized by the fancy scabbard of Venetian gold-brocade, we can finally pull the magic sword – and see the secret inscription on the blade: which is the Truth of Mazadan. 3. Josep Pijoan, Les pintures murals catalanes, (Barcelona, 1911).